We work with a wide range of students from across the UK; from mature learners to the average college leaver, and always ensure we offer a personalised service to help students on their journey to Higher Education. 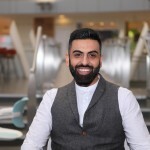 Recently, Mohammed put these skills to the test in Prague at an international recruitment fair, which also involved a rendezvous at the British Embassy. I had the opportunity to represent the University of Bradford in the beautiful city of Prague. The trip consisted of events where I would get a glimpse into the nature of students from the heart of the Czech Republic and build relationships with schools and colleges that nurture their academic talent. It was inevitable that I would reflect on the comparative similarities and differences between students from UK and the learners from the EU. Extensive travel and experience in the national regions with national students has allowed me to build a general list of questions and queries that students tend to ask. Questions posed by Czech students had a similar theme, but as expected for a student with little or no knowledge about the University of Bradford and the city of Bradford, there were many questions regarding the City itself. The students were pleasantly surprised in learning that Bradford is one of the most affordable university cities in the UK and were very interested in the multicultural aspect of Bradford. I got to learn very quickly that the Czech students were very appreciative of receiving feedback on their command of the English language. My trip to Prague ended with a visit to the British Embassy, the evening began with me doing a presentation on the University of Bradford, and this included an overview of student accommodation and student life in the UK. An emphasis was made on the safety and supportive nature of universities especially towards students from overseas. The presentation allowed the schools and colleges to have an insight into what student experience in the UK may look like. The remainder of the evening was spent liaising with the representatives of schools and colleges from the Czech Republic allowing for new relationships to develop. There was keen interest from reps to learn more about the support the University of Bradford would give to students from Czech Republic. I ensured that all the questions were answered and relevant information was left with the reps. Since the event there has been a request for the University of Bradford to come visit some of the schools and colleges that were present at the British Embassy event.